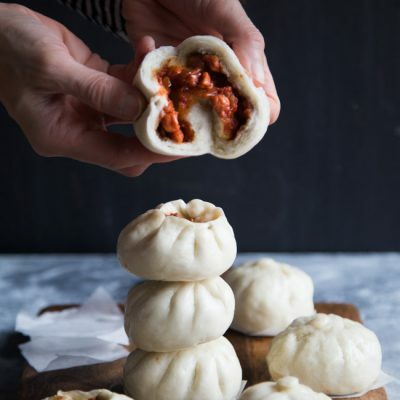 Soft Fluffy Char Siu Bao (Chinese Steamed Pork Buns)- Juicy and sweet Chinese bbq pork (char siu) is wrapped in soft and pillowy Chinese steamed buns. 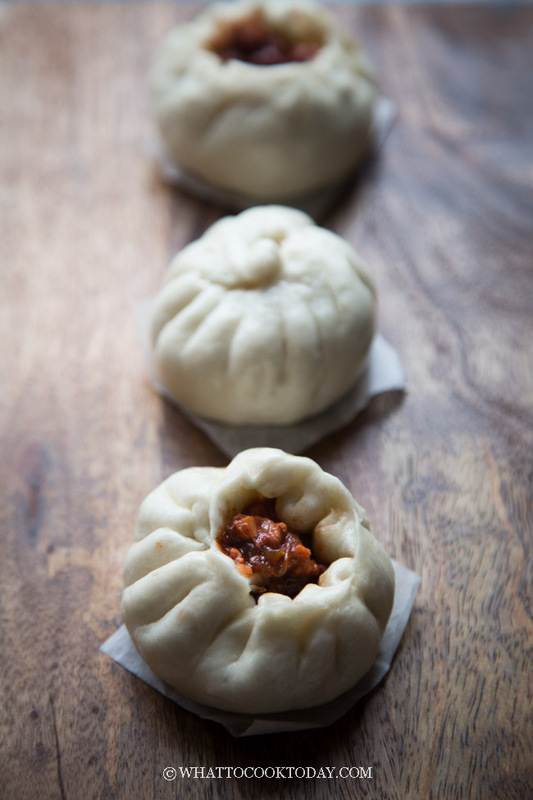 Steamed Char Siu Bao (Chinese BBQ Pork Buns) is one of our favorites in the house. My two kiddos love char siu. 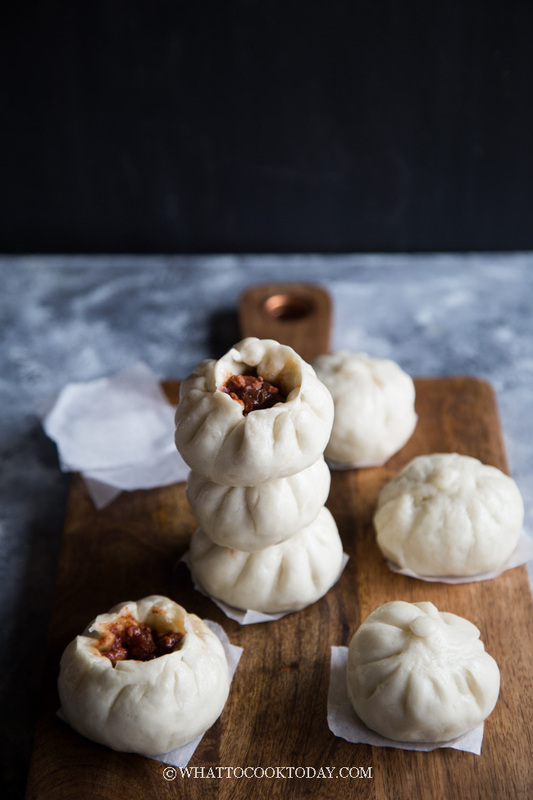 When you have a good soft and fluffy steamed buns recipe on hand, you just need to make the sweet char siu filling and you are all set for steamed char siu bao. 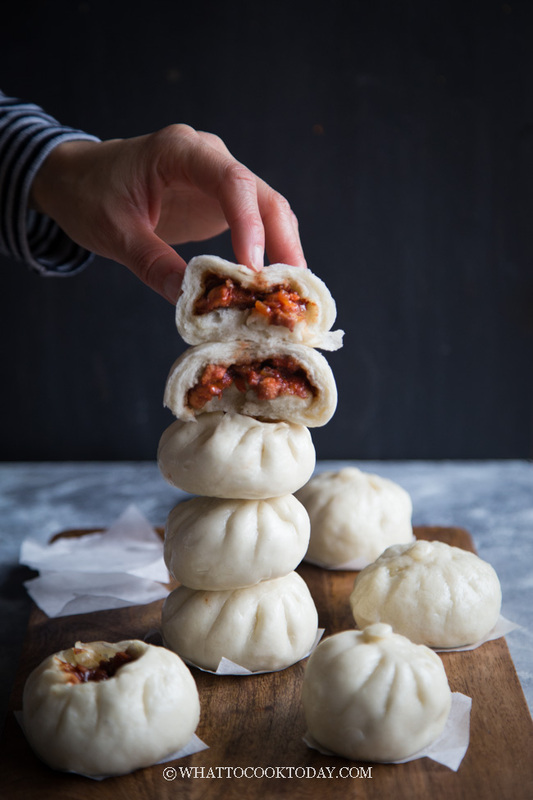 You can read more in detail about how to make soft and fluffy steamed buns. 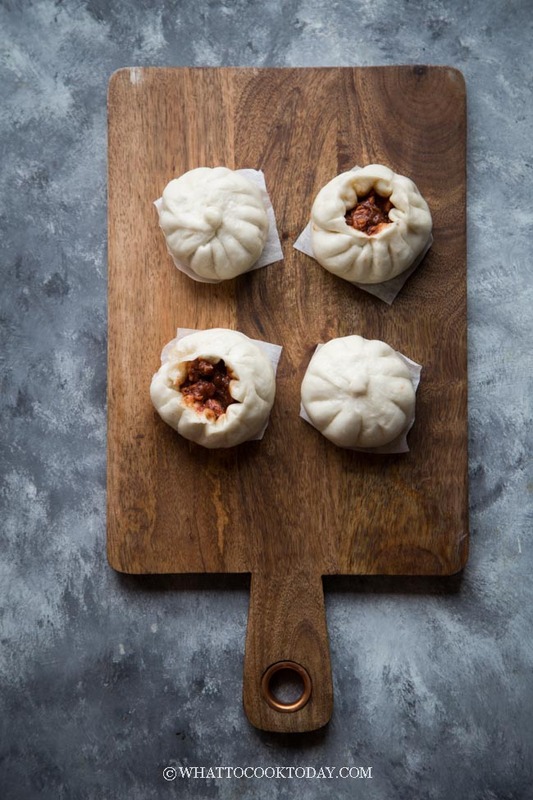 I use this basic steamed buns recipe in all my other steamed buns with different filling varieties. 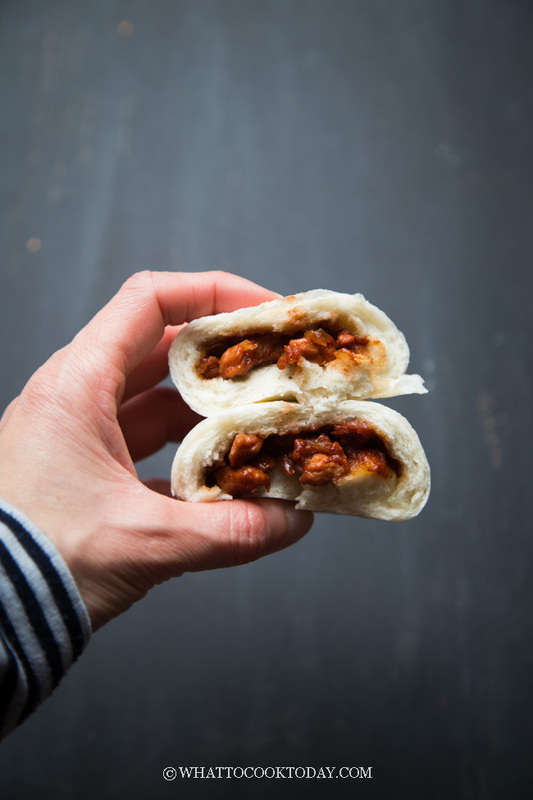 The nemesis of filled steamed buns is wet filling. 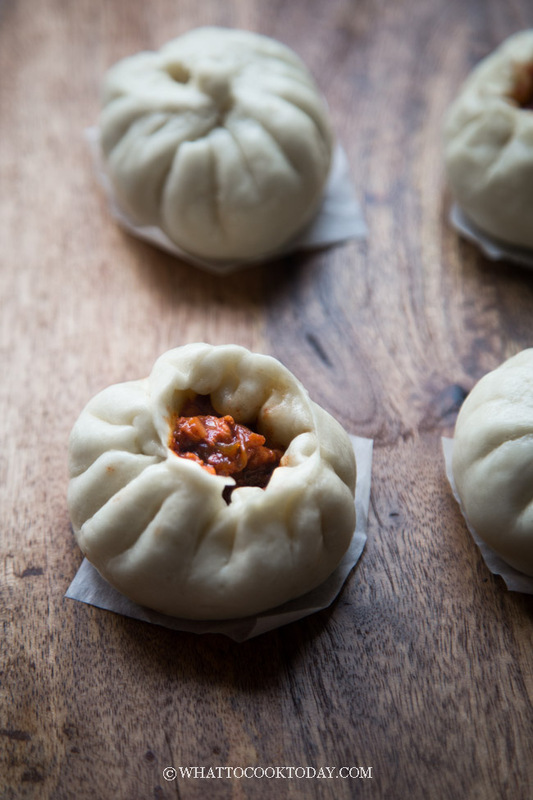 The wet filling will cause the steamed buns to wrinkle and also creates some burn spots. The filling in this recipe is thickened with flour so it’s easier when you wrap and the buns whole its shape when being steamed. This recipe requires that you proof the buns only once. Making char siu filling is really easy. You can either use homemade char siu or make it from scratch easily using pork or chicken meat. The sauce used to make char siu filling is very similar to the marinade you use to make char siu: onion, hoisin sauce, oyster sauce, sugar, and cornstarch. I like to add onion because it adds extra flavor and sweetness to the filling. WHAT MAKES CHAR SIU FILLING RED IN COLOR? The red is really only for coloring. Red is one of the colors that is considered good or lucky for most Chinese. I use red yeast rice powder that my mom brought me from Singapore. I know some people just use red food coloring. You can totally not use any red color at all. The most important thing is the taste of the char siu itself. The color doesn’t alter the taste in anyway. 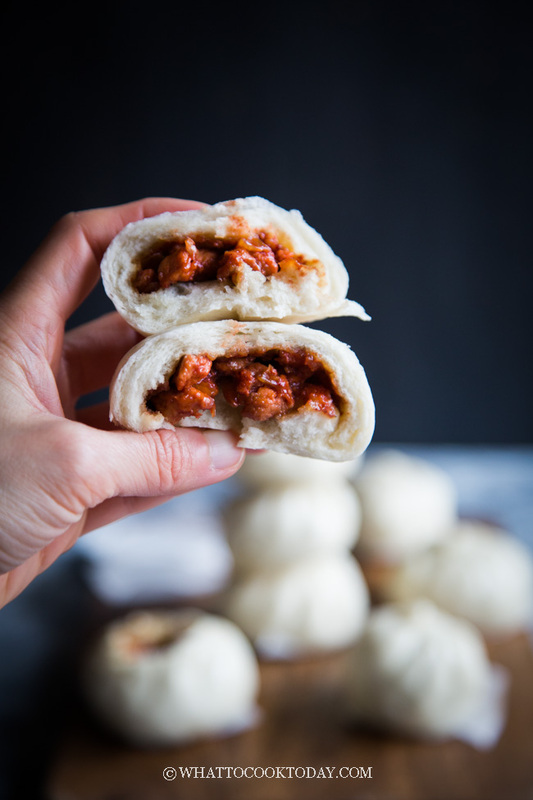 Juicy and sweet Chinese bbq pork (char siu) is wrapped in soft and pillowy Chinese steamed buns. Looks delicious. I loved steamed buns! 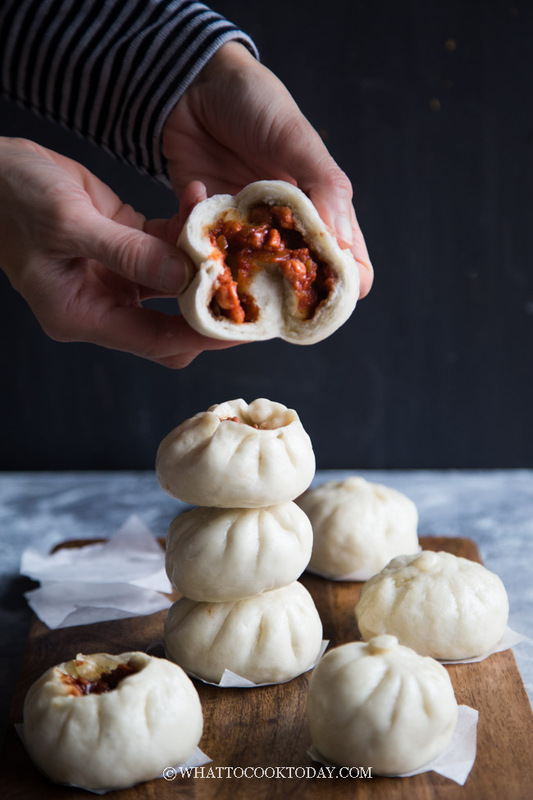 I adore steamed buns but have never made them at home! Thanks for posting this, I might even attempt it now :o) They look delicious! The reason why the ones in the restaurants are so perfect is because the folks who make them have been doing it a long time. Practice makes perfect! Keep on making them – who cares what they look like as long as they taste good? These look amazing. I want a whole plate full. I’ve finally “succeeded” in pleating the bao (post coming up soon) LOL! practice makes perfect for real!!!! Fabulous! Just tried these but with good quality gluten free flour ( it has tapioca starch and xanthan gum in it ) but added 1 TSP of lemon juice as I’ve been told acid is needed in gluten free recipes with yeast. An absolute hit and will definitely make again. Hi Carol, I would love to try out the gluten free version too. I just bought a gluten free flour, but mine doesn’t have xanthan gum in it. OOpss!! I guess I need to get xanthan gum then! I will definitely try it out with a lemon juice too!